With most of the leaves now sitting on the ground, the Haven Hill area looks much different. This special time allows us to see the lay of the land and just how the Estate and it’s features where set up. I have discovered many things on the Hill and surrounding areas at this time of year. You can see those things that where so well hidden by the overgrowth of Trees and ground cover. When the Ford family where living at the Estate, there where many young trees. Almost 80 years latter, the long views of the Lake and Farm, from the hilltop, are now obscured by the growth of these young trees to mature ones. Not only have the long views been blocked, but so have even the short views of just where everything was at. At this time of year, it is easy to find the Dog Kennels, or walk the entire length of the Toboggan run. It is also a great time to discover the many walking and riding trails the Ford family created for themselves, that are now abandon and buried beneath the growing hillsides. Walk slowly……wader off the main trails, and remember that what was very visible almost 100 years ago, is now……in many cases, buried under or obscured from view, by a quickly growing Mother Nature. Exploring Haven Hill is always a fun time. 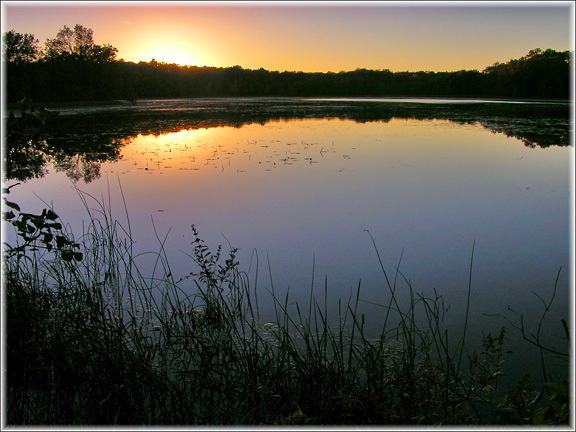 In 1954 the state designated the Haven Hill area, a State Natural area and Nature Study area. They did this because of the diversity of habitats there, and because of the big push from the Michigan Botanical Society. Most people do not know that the Haven Hill area is not just a state designated Historical site, due to the remains of the old Edsel Ford Estate that was located primarily on Haven Hill, but actually made up what is now the entire eastern side of Highland Recreation area. That’s right…..all the park lands that are east of Duck Lake road was once the boundaries of the Ford Estate there, with the Lodge and main Estate buildings located on top and around the edge of the main hill. But……all the lands north of Haven Hill and that surround Haven Hill Lake are part of the state Natural Area. The many natural Springs, the swamps, the deep cuts in terrain and rolling hills have produced many diverse ecosystems. Some of which only exist in more northern areas of our state. As Spring starts to break and everything goes into blooming stages, it is a wonderful time to take a Hike around Haven Hill Lake. There is a good solid, maintained Trail that encircles the Lake and will also take you through the main Estate on Haven Hill for your return Trail leg. A beautiful Boardwalk takes you around the northern most Swamp areas of the Natural Area. Many small creeks exist here, due to the many Natural Springs through out the northern and western side of Haven Hill Lake. There are many rare flowers and plants along the way. Just like exploring for remnants of the Ford Estate on Haven Hill, you need to look closely as you Hike the Trail loop around Haven Hill Lake. The Fords did very little to the north and far western side of the Lake Edsel created by damming Cedar creek. So the primary focus on this Trail surrounding the Lake are ecosystems and different environments. If ever you carried Nature ID guides along on a Hike, this would be the place to do so. There are examples of almost every Tree that grows in the state of Michigan, somewhere along this main loop Trail. Download one of the Maps from the web site and get started not only exploring the past in History, but the present in the extensive Natural world in and around Haven Hill. We are again in our early Spring planning stage for our first History HIKE of the year. We try and do one every Springtime because of what we talk about here on the Blog, all the time. The foliage is way down and so much more can be spotted while roaming the Estate at this time of year. This year we will be doing our Spring History Hike a little close to early Summer, like the first week in May. The only real foliage we will need to be concerned about will be the Poison Ivy. Poison Ivy has become almost rampant around the Haven Hill, main hill area of the Park. Although found everywhere at Highland Rec., it is very prominent around the Hill itself. It is about the only concern I have when Bushwhacking around the Estate. This years History Hike will have a couple of twists to it. We have been talking about doing a dual Hike day. One group will head for the Haven Hill top and explore the main Estate features, including the Pump-house, Well house, Formal Gardens and some of the Man-made ornamental Ponds located on the Ford’s private Nature trails, just off the main Estate Hill top. ore some abandon Cabins dating back to the 1800s, as well as some possible Native Hunting camps and areas. We will circle back and crawl up the North side of the Estate Hill, using some of what is left of the old Toboggan run. But before we do that, we will show everyone where the actual Toboggan run ended and some of what was happening down there when there wasn’t any snow going on. These places are not easy to access, but are very interesting in the whole History of the area known as Haven Hill. Before Edsel and family, there where local settlers. Before and during the Settlers, there where Hunting Camps. before the settlers and Hunting Camps there where Native American encampments and wanderings. There has even been some talk at one time, that the Huron river came through the back side of Highland Rec. area, and not it’s present day course. This would have made this area of the Park even more attractive to the Natives then it already was. With a water route in the area, the game and many plant & tree species, all the fresh natural Spring waters, this section of Highland Rec. area would have been the perfect Native hunting/Homestead grounds. Just what the white-man made it as he settled into the area. It is always a great time to wander Haven Hill around the old Ford Estate, or the State designated NATURAL area. Which is basically the areas that surround the man-made lake that Edsel made by damming Cedar Creek and forming Haven Hill Lake. 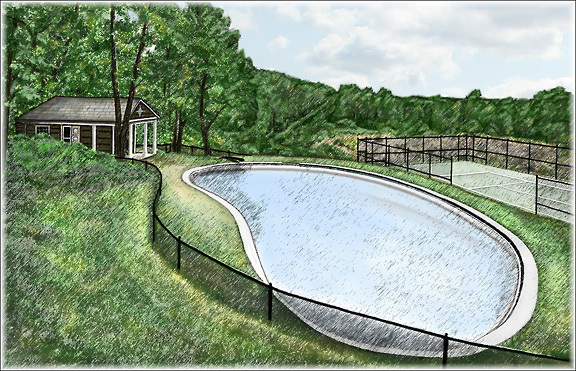 As a side note: The Dam project at Haven Hill Lake, was the first thing Edsel started at the Estate. The project was immense! Take a close look at one of the free Maps from the Haven Hill Project web site and look closely at all the empoundments that where built, as well as the Dam, to truly create Haven Hill Lake. Remnants of some of the many impoundment retaing walls, buried along side the Trails that surround the Lake. Look closely as you walk around these Lake Trails. Why is this this extra special time of year so special at Haven Hill? Because right after the winter months, and the leaves are gone, and the landscape has been washed clean, much is exposed around the Estate. Things that where buried in the thick growths of summer foliage and ground cover are revealed. Benches and old Horse Trail buildings become apparent. The Ford family had an extensive Hiking and Horse Trails system through out the Estate grounds, complete with rest stops, Water pumps, Benches and small rest stops. Not to mention small creek bridges and many other small Trail structures. Most have been lost to age. Others are no longer part of the regular Trails system marked on any of the Parks Maps. But remnants of these places are everywhere, and can more easily be found at the time of year, just after the winter months. Ornamental Pond built at one of the Bench rest-stops on a Trail that was for the Ford Family use only. So…..right before all of those Spring flowers and young growth start to pop up around the Park, take a visit around the Haven Hill Estate and explore. Truly explore there. Wander off the main Trails, and keep your eyes open for a Horse Hitching post, or that old resting Bench. You will be very surprised at what you will discover while you enjoy what the Fords loved so much of their home and this once beautiful Estate and Grounds. Since all of our Publications will FINALLY be released in 2013, we are showing off a number of things from these Books and Guides. We are starting with a condensed version of the History of Haven Hill and Highland recreation Area. This two page History sheets, starts in the late 1800s and will take you to the present day. Remember that this is the shortened version, so we only cover the highlights, starting with some of the earliest Settlers in the White Lake area, and take you to a time after the Fords had sold their Estate on Haven Hill, to what is now the Department of Natural Resources, who created Highland Recreation area, shortly there after. You can download these History sheets at the Link below. For a truly fun packed afternoon, may we suggest that you download these History sheets and the two Maps available from both this Blog and the web site, and then head out to the Park. Take a Hike/Exploration tour of what remains of the Ford Estate on Haven Hill. head back down the Hill and enjoy a break and some Picnic Lunch at the meadows Picnic area. From there, head over to the Dam on Haven Hill Lake and follow the trails around the Lake and through the main grounds of the state designated Natural area that surrounds Haven Hill Lake. You will not forget this afternoon for quite some time. The combination of Nature and History, with a relaxing break in-between at Haven Hill Lake, will be so packed with something for everyone, you will not soon forget it. Definitely bring your Camera along! If you want to explore History on your own, then head out to Highland Recreation area, and visit the Edsel Ford Estate on Haven Hill. Built in the late 1920s, by the only son of Henry Ford, Edsel and Eleanor Ford raised their family on this once huge Estate. The entire Estate makes up what is now the whole eastern side of Highland Recreation area, from Duck Lake rd. to Ford rd. This was an enormous Estate with full working Farm, Lodge, Carriage house, Pool, Gardens/Fountain. The small creek running through the property was dammed to form Haven Hill lake. These days, the property surrounding the lake is a state designated “Natural Area”. The Lodge burned down in 1999, but the foundations remain. The Carriage house, Pool, Kennels, Toboggan run, Fountain/Gardens, Tennis Court and remnants of the gigantic Green Barn, still remain to be examined and explored. The Carriage house. This was the Ford’s Drivers home and kids playhouse. There is much still hidden in the surrounding forests of Haven Hill. The Ford family’s private Nature Trails, Horse riding rest stops, Ornamental Ponds and many other features at the Estate, now buried in the foliage there. The Pool and Tennis Court is now buried in the surrounding forest. At this time of year, the thick forest and undergrowth has died back and so much more can be seen of the Estate and it’s hidden features. Wander off the main trails and explore what maybe few people have seen. Keep your eyes open because there is also much wildlife in the rolling hills there. Some of the highest points in Oakland county are here on the designated Historic, and Natural areas of the Park. The Farmhouse and Horse Stable, now being used for Park Maintenance. 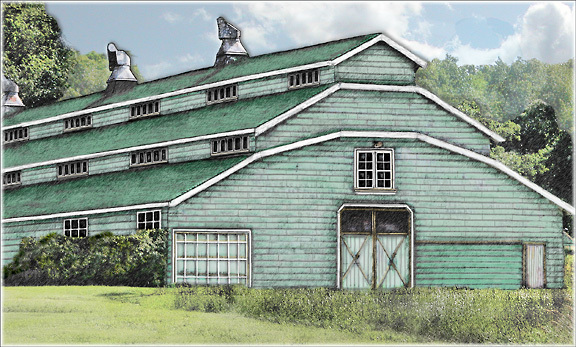 The Green Barn. Most has been blown down over the last few years. 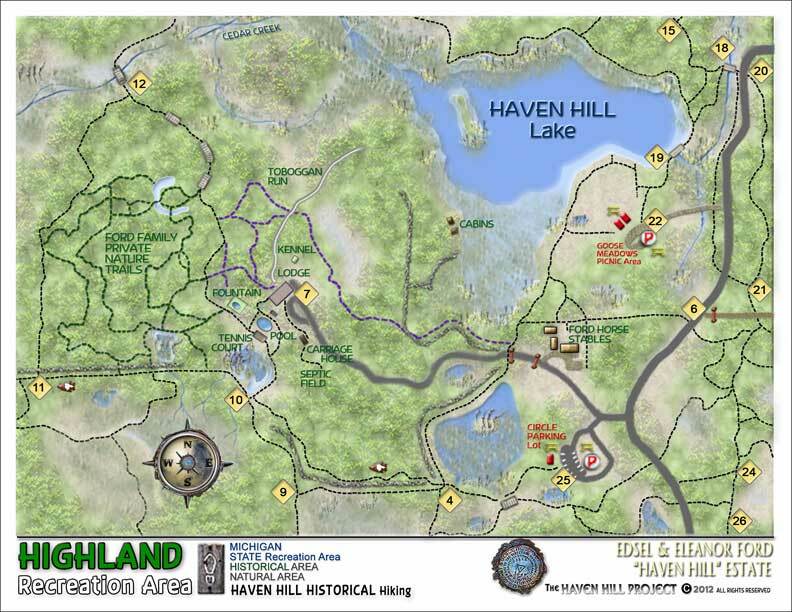 One of three free maps available on the Haven Hill Project web site. These maps are very detailed and are great exploration guides of the entire Park. GPSed multiple times, the maps indicate the Estate features, as well as the modern Trail signs and much more. 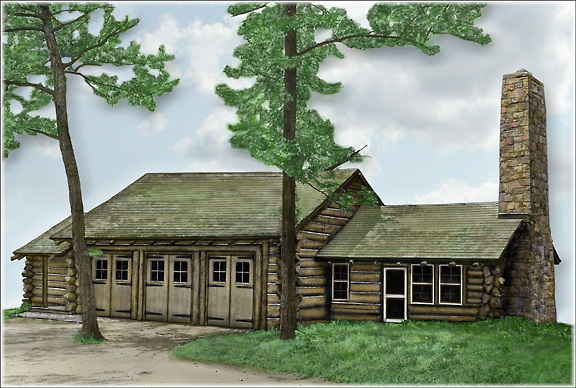 The drawing above are renditions of what the Estate’s structures looked like in their prime, in the late 1920s.